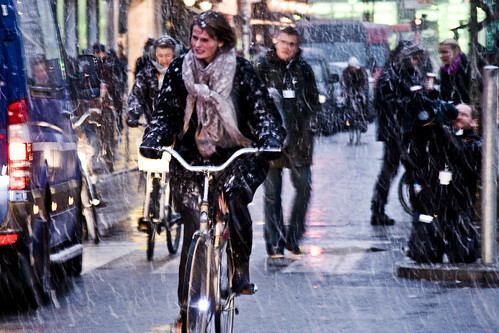 Classy Copenhageners making winter cycling look so good. Cool shot, but the conditions for cycling fatal. wow...that is crazy! & scary! I hate to say it, this would never work in Chicago. if it was 'fatal' hundreds of thousands of danes wouldn't do it in this weather. Fatal because of a bit of snow? Hardly. I have not noticed *that* many corpses lying in the streets lately. lol. check the snowdrifts. that's where the corpses are. She doesn't look like she is having fun. just because you're squinting into driving snow doesn't mean you're not happy. Riding in the snow is much better than riding in the rain. Just because you're happy doesn't mean you are having fun.